Air Niugini’s subsidiary company, Link PNG’s “Combi” aircraft proved invaluable last week, when the airline delivered exam papers to provinces on time for the grades 10 and 12 National examinations. In a “Combi” flight, the aircraft is configured to carry both passengers and cargo, with a partition in the aircraft cabin to allow both areas to be utilized at the same time. In other words, it’s a combination of passenger/freight service. Mixed passenger/cargo “Combi” flights are being operated by Dash 8 aircraft to airports where Air Niugini’s Fokker 100 aircraft cannot operate to. Schools in West New Britain were among those who benefited from the service provided by Link PNG’s fleet of “Combi” aircraft last week as the Hoskins airport runway is currently being redeveloped so that it can cater for the larger Fokker 100 and F70 jet aircraft. Link PNG’s Dash 8 aircraft uplifted examination papers weighing 6 tonnes to Hoskins airport, in two “Combi” flights last week. 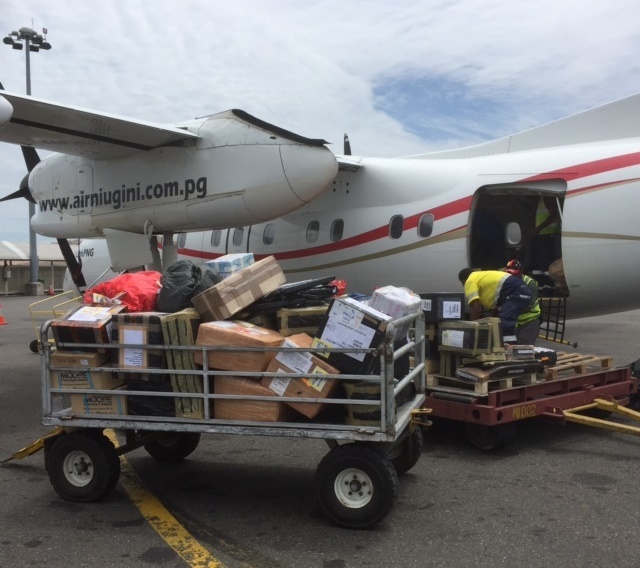 Air Niugini Chief Executive Officer, Mr Simon Foo said the use of the DHC-8 Combi aircraft allows the airline to move larger amounts of cargo at one time, and also to uplift bulky cargo that would not otherwise fit on other scheduled commercial flights. As well as Hoskins, Link PNG has also been also been using it’s “Combi” aircraft across a number of other destinations over the Air Niugini network, and wherever the demands exists the airline plans to further expand its use. Meanwhile, Air Niugini Cargo has also commenced a project to revamp its internal systems to ensure efficiency and effectiveness. When customers lodge their cargo, they will also be advised there and then as to what flight the cargo will be traveling on and ensure it does indeed travel on that flight.